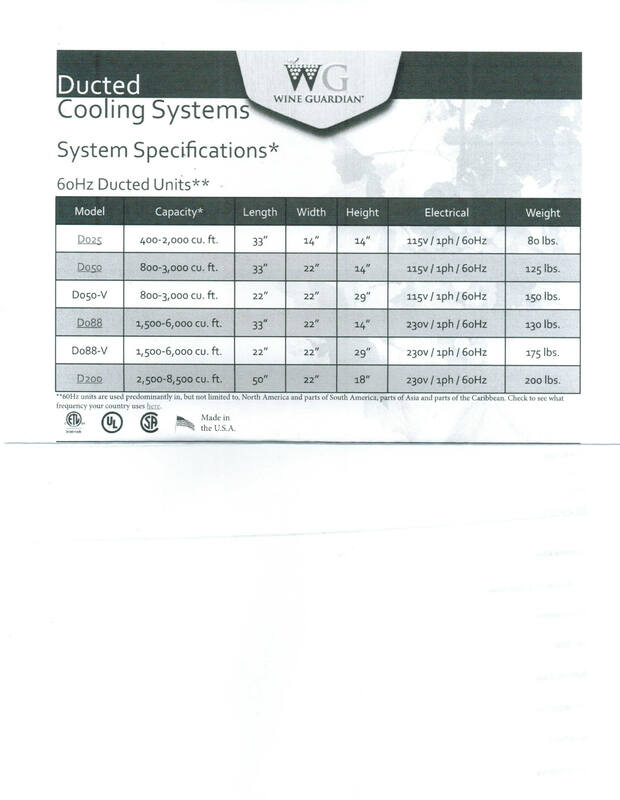 Use this condenser option where installation site temperatures consistently surpass 95 degrees or noise is of issue. A ½" water line (¾" for the 2 Ton model) is all that is required for this option which eliminates the condenser fan. "Leaving water" is clean, and is acceptable for sewer or makeup water. The Wine Guardian ducted cooling unit is installed in an adjacent room and pumps cold air into cellar via one or more cold air supply ducts. A warm air return is also positioned in the cellar to allow for air circulation to go back to the Wine Guardian. Installation site should be within 25ft of the Wine Cellar. Utility rooms, mechanical rooms, attic or crawl spaces are potential locations. The Wine Guardian can be mounted on the ceiling, the wall or the floor. Wine Guardian airflow and performance ratings are based on the use of 25 feet of ductwork per side. Integrated temperature and humidity gauge included with all ducted units. A digital thermostat & 25ft of thermostat wire also comes with the unit. 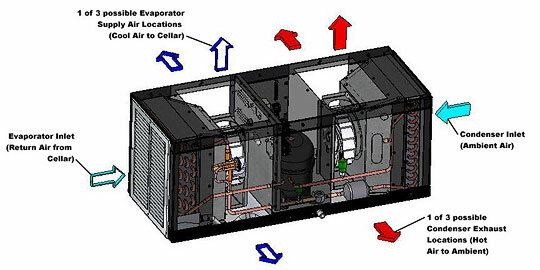 Wine Guardian contains both an Evaporator and Condenser. There is a constant exchange of air with the Wine Guardian & the cellar. Cold air supply is ducted into the wine cellar through one of more ducts depending on size and configuration of the room. Air from the wine cellar returns to the Wine Guardian via a return air duct where it is cooled and supplied back into the cellar. Multi panel construction (for attaching ducts) allows for flexible installation; of floor, ceiling or wall mounting of the unit. Designed for keeping properly insulated wine cellars at 55/56 degrees. Not meant for lower temperature applications, but potentially can be configured for as low as 50 degrees. Can also be configured for 72/74 degrees with humidity specific requirements such as artwork, archives, musical instruments. For the standard Wine Guardian, the installation site temperature should not be higher than 95 degrees; if higher, then you may need to look at Water Cooled Option or have fresh air duct to the installation site AND vent the exhaust. STANDARD UNIT - To also decrease the temperature of the installation site, warm air exhaust from the Wine Guardian condenser can be ducted out of the room. If the install room is at least 2 1/2 times larger than the wine cellar, then generally no need to duct the hot air exhaust as room temperature shouldn't change. WATER COOLED UNIT - Because this unit doesn't get hot - it can be installed in a closet or confined space. The water cooled can now be ducted into home swimming pools, please specify at time of order your interest in doing this. When should I spec a water-cooled WG? Water- cooled units are ideal for most high-rise apartment complex applications where most have chiller or cooling towers as part of the building mechanical system. Another application would be restaurants or country clubs that have the ability to tie the system into the dishwashing system. The water-cooled Wine Guardian is physically the same size as the standard air-cooled model but requires no airflow across its condenser. The unit uses water instead of air to cool its condenser, therefore no outside venting or cool air to the unit is required for operation. The system only uses water when there is a call for cooling. When the temperature in the wine cellar is satisfied the compressor and water shut off. The water-cooled Wine Guardian requires two water connections, one (1) in, one (1) out, primary power, drain and wine room side ductwork connections. Each of the ducted systems already comes with two duct collars (one for supply and one for return on the evaporator) These two duct collars will satisfy most configurations. You only need to order additional duct collars if you plan on having secondary supply or will be ducting the condenser side. The Ducted system also already comes with the Remote Interface Controller. VERTICAL Systems also available for the 1/2 ton and 1 ton - The vertical design offers more flexibility for installation in more confined spaces. The vertical ducted or water cooled ducted system takes up less space then the traditional horizontal units. See Additional Info tab for sizes. What if I have more than 5500 Cubic feet? Larger applications are easily covered using multiple units. What are other Wine Guardian features? One Return and One Supply Duct Collar are included for the evaporator side. The unit may be ceiling, wall, or floor mounted within the wine cellar, or may be located in an adjoining space. 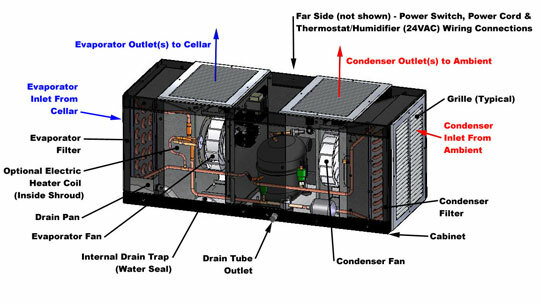 The unit is designed for easy installation--refrigeration contractor is not needed. All panels are removable for maintenance and duct connections. Integrated Digital Controller: adjust temperature and view humidity from the same digital display. 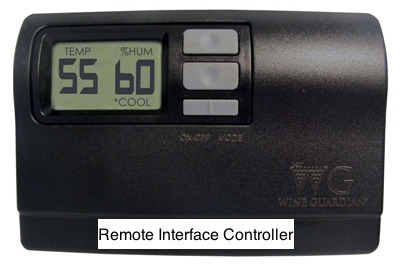 If humidifier or heater option is purchased then you will be able to control humidity & heat with this controller as well. Wine Guardian is essentially maintenance free. The refrigeration system is hermetically sealed and requires no maintenance. Fan motors have permanent lubrication. Filters should be checked monthly and evaporator coils checked every three months. All panels can be easily removed. Wine Guardian conforms to UL & CSA standards. View all options available with the Wine Guardian via a singular control panel. View digital readout of temperature and humidity in single location. Temperature is controlled on this panel, cellar's humidity will be displayed. You will need the WG humidifier option to adjust humidity on this panel. If you have the WG heater and humidifier options, then these will be connected to this singular control panel. Also included - Temperature & humidity alarm systems. Controller can be installed remotely and used with the optional remote sensor. Connect up to three optional remote sensors within a larger or unusually shaped wine cellar to measure temperature and humidity in various areas; panel controls their average value. According to Wine Guardian - Wall-mounted thermostats are much better at keeping the wine temperature constant. The accuracy of in-bottle probes or sensors is similar to that of wall-mounted thermostats, usually plus or minus 1°F. Which means that the sensor will turn on the cooling unit when the temperature is 1°F above the set-point temperature and will keep it running until the temperature falls 1°F below set-point. This is a 2°F swing in the temperature. For in-bottle probes, this is the actual temperature swing of the wine in the bottle and it occurs each time the cooling unit cycles on and off, maybe several times per hour in warmer weather. For a wall-mounted thermostat, the cellar air temperature will go through the same 2°F swing, but the wine temperature inside the bottle will not because of the thermal mass of the liquid and the glass. Actual temperature measurements of the liquid will not vary more than a small fraction of a degree Fahrenheit. Air temperature will change whenever the cellar door is opened. Up to 3 remote sensors can be installed and positioned within different areas of your wine cellar, be sure to order extra remote sensors at the time of ordering your Wine Guardian ducted cooling unit. If you would like racking as well, we will be happy to customize a design and obtain a shipping quote for your entire order. Click HERE to go to Racking Pages. When adding the options below. Please choose all the options you would like and then add the entire bundle to the cart once.